Return Policy: Returns accepted up to 18 months This product contains software or Internet access code(s). Returns are not accepted if seal is broken or if access code revealed. Abstract: This 8th Edition of Moss and Adams' Heart Disease in Infants, Children, and Adolescents: Including the Fetus and Young Adult, provides updated and useful information from leading experts in pediatric cardiology. 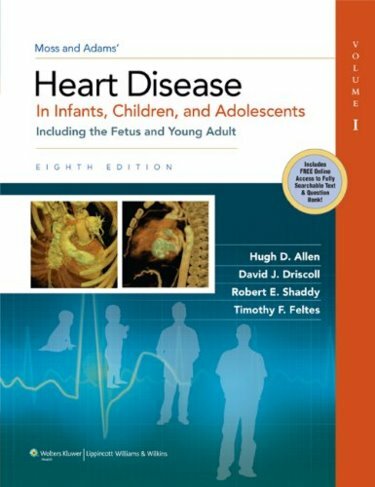 Added chapters and a companion web site that includes the full text with bonus question and answer sections make this Moss and Adams' edition a valuable resource for those who care for infants, children, adolescents, young adults, and fetuses with heart disease. Features: Access to online questions similar to those on the pediatric cardiology board examination to prepare you for certification or recertification. Leading international experts provide state-of-the-art diagnostic and interventional techniques to keep you abreast of the latest advances in treatment of young patients. Chapters on quality of life, quality and safety, pharmacology, and research design add to this well-respected text.